In a week I am dropping my firstborn off at college. 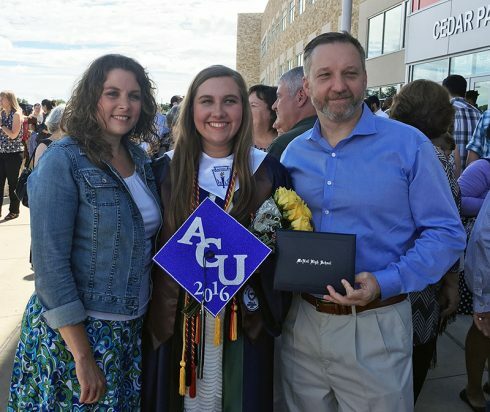 For the last several weeks people have been asking the obligatory question of first-time college parents: “How are you doing with all this?” You’ve probably heard a variation on that question yourself. Overall, my answer has been, “Pretty good.” I mean, what are you supposed to say? And I was doing “pretty good” until last Sunday when my daughter mentioned that she has one more Sunday at church with the family. Gulp! When you’re talking months, weeks and days until she leaves, it seemed very arbitrary. But when you talk about concrete “last times,” it all of a sudden hit me hard. Going to church together as a family has always been a huge part of our lives, and now I realize I am seven days away from that changing! I know that there have been a lot of “lasts” this year, but most have not been as personal and meaningful as this. I will mourn this “last time.” I imagine I will mourn many things that are over. But that’s part of parenting, isn’t it? You mourn many “lasts” over the life of your child – even the things that you sometimes wish would go away. But at the same time I celebrated the “firsts.” First night in a big-girl bed, first words, first steps, first day of school, first night away from home, first time to drive alone. Parenting has been a mixture of mourning the “lasts” and celebrating the “firsts.” Those two emotional actions, mourning and celebrating, can seem mutually exclusive, but they aren’t. They run side by side like the two rails of a train track – parallel and leading toward the horizon. So I will mourn the last Sunday at church together and celebrate my daughter finding her own church family for the first time. I will mourn the last time I get up early to cook her breakfast before school and celebrate that she will get a first breakfast at the World Famous Bean. I will mourn the last time we take that first-day-of-school picture before heading off to school and celebrate that she starts her first day, excited and independent at ACU. Mourn and celebrate. That’s parenting, isn’t it? Wow! I guess many of us are going through the same roller coaster of emotions. For me it is taking my first child to the airport and kiss her and hug her, because we won’t see her until Christmas. We live in Guatemala! So I know once I get back home from the airport, I’ll start marking the days until I see her again!